I just finished reading Donald Miller’s book A Million Miles in a Thousand Years: How I Learned to Live a Better Story. In it, he talks about his friend, Bob. Bob has done a lot of cool things all over the world. One year, while sitting around on New Year’s Day and thinking about how bored they were, his family decided that they would do a parade. They wanted to include the neighborhood. So, they went to their neighbors and told them of their plan. Only, there was a catch. This wasn’t a parade to watch. They wanted everyone to be in and no one to sit and watch it. Crazy, right? Well, they have been doing it for years now and it’s a huge deal. People plan their vacations around it. They fly home from other parts of the country to participate. Some years they choose a woman from a local retirement center to be their “queen” and this year they brought a young boy from Uganda to be the Grand Marshall. Bob says this is this is the way to do life: Everybody is in it. Nobody is watching. I can’t wait to read Bob’s book! Running at Pinkerton Park with my friend Melissa. Nathan helped a coworker move. The kids rode their bikes. Reading more books on my new Kindle. This is a good one. I can’t wait to blog about it. There was a ton of information to digest. I’m not going to go into it all because that would be boring to most people reading this. The top two things really stood out to me. There were the obvious issues with violence in some games. That didn’t surprise me. The part that I thought was a good reminder was that video games can cause your child to disengage from real life. It needs to have a proper place in the life of the child: after school work, after time with friends, after physical activity. Boys have a desire to compete and to win at something. There are better ways to tap into that. Video game worlds give a false idea of what reality is. Many 5 year old boys are not developmentally ready for some of what we’re asking of them in Kindergarten. The risk is that the child’s first experiences with school are negative. It’s too hard and he thinks he’s not smart enough or good enough. Not enough real-life experience/field trips/nature. Giving assignments that cater to girl brains: asking boys to write essays on how they would “feel” if they were a certain person/character when their brains aren’t developed in that area until they are older. I enjoyed the book. There were some great reminders of the differences between boys and girls. I also took away some practical things I could do to help my boys succeed. 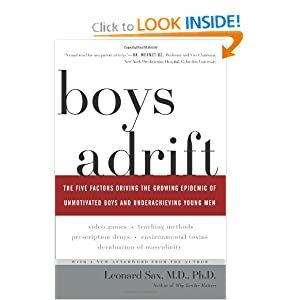 The author is a family physician and a research psychologist. Background in both of those areas made the book more compelling. I’ve been off the wagon and on the wagon and off again so many times. At this point I can’t count the pounds that I’ve lost and gained all over again. I’m not giving up though. So, I’m back to doing an official weigh-in on Fridays. This is my “Before” photo. By the way, if you want a particularly unflattering picture of yourself, you should definitely ask someone considerably shorter than yourself to take it. Wow. So, obviously, the green shirt picture is my “Before” picture. That’s from today. The black shirt picture was my “After” photo from two years ago when I lost most of my baby weight from Isaac. I’ve gained 18 pounds back. My clothes don’t fit and I have not been taking care of myself. I’ve been dealing with my emotions by eating. Feel free to tune out of Fridays if you’re not interested. Checking in on Fridays helped me with motivation before. I’m hoping it helps again. This picture is really random, much like this post! Audrey set this bear up on our couch a while ago to cheer me up. I think I was having a rough day. It was very sweet of her! I’ve been doing school with the kids. I’m not on our “regular” schedule yet, but I didn’t want to completely stop for the summer. Ethan started Singapore Math. It’s been a good switch for him. It has more pictures :-). He thinks that’s cool! I’m easing Audrey into Kindergarten. I’ve been looking for some fun young-elementary appropriate historical fiction to read about Colonial America for everyone. Still looking for the perfect thing. We used our Usborne Science with Water book today. Actually, Ethan pulled it out, started reading it and got out what he needed to do some experiments. Soon the other kids joined in. We have gone swimming three of the last four days. I’ve been reading a lot! The books I’m currently reading or just finished reading: Boys Adrift- The five factors driving the growing epidemic of unmotivated boys and underachieving young men (at the recommendation of Steph), A Love the Multiplies by Jim Bob and Michelle Duggar, 100 Top Picks for Homeschool Curriculum by Cathy Duffy, A Gift of Mourning Glories- Restoring You Life After Loss, Fresh Faith by Jim Cymbala, Get Out of That Pit by Beth Moore and Radical by David Plath. So, I have A LOT on my mind! Nathan and I had strange dreams on the same night. I dreamed that I was pregnant, but for some reason ashamed of it. Nathan dreamed that we adopted 12 children. Ethan is starting to learn to play piano. Much more fun than a book! Since we started our Financial Peace classes in January, by God’s grace alone, we’ve been able to pay off 65% of our consumer debt! We only have our van loan that we’re working on right now. We had a tiny bit of credit card debt when we started, but most of what we’ve been working on has been the van loan. It feels really good to be making progress. We know this isn’t exactly according to the rules, but we have added to our emergency fund a little here and there too (above the basic emergency fund) because of the situation with the house in MN. We need to make sure we have funds available should our renters not be able to pay their rent on time or if we needed to fix something big. It has been a good thing that we have done that because we waived the rent entirely for this month because of the issues with the house while needing to pay a plumber to scope the drain, a handyman to replace the basement carpet and a dryer technician to work on the dryer. It has been encouraging to see how God has provided. If we tighten our belts really tight for the next several months, we might be done with the car loan by the end of the year! Last week, I decided to move Audrey’s bed into the boys’ room. It’s now the “sleeping room”. All the toys went into Audrey’s old room. Audrey’s full-sized bed is taking up a lot of room. We’re going to get rid of it and get a twin bed instead. It’s kind of fun to switch things around every once in a while. p.s. I don’t think I ever updated you all on how Nathan did with his ebay auction selling his Star Wars cards. The auction closed last week and he got $510!